Oil Pulling plus Bonus Natural Teeth Whitening with Activated Charcoal! You’ve probably heard about oil pulling by now (if you haven’t, learn more here). Maybe you even saw my post last week about how I used it to get my gums to stop bleeding during pregnancy. There is a lot of information about it floating around, and although I can’t give you any peer reviewed double blind research study support for it, I can tell you about my experience and that of my clients and friends. I’ll spare you from re-telling you why it’s supposed to work and what exactly it can do for you, except to say that the main concepts behind it are to (1) reduce the amount of plaque on your teeth and (2) improve the health of your mouth overall. My friend Alison mentioned last week that she had read it is possible to do oil pulling too much–because it removes the protective waxy layer from your teeth, and I think it’s important to consider that when you decide to start oil pulling (I’ve found that doing it 2 or 3 times a week give me great results). The thing is, this is s a natural approach to getting healthy teeth, and it should never replace your regularly scheduled dental visits with your amazing and trusted dentist (and if your dentist is meh, then find a new one you like!). I always lean toward more holistic care, and I have not yet found a holistic dentist I like in LA (since I’m pregnant right now, I’m just trying to maintain my healthy teeth and not do anything too new or crazy). I don’t know if dentists would encourage people to do oil pulling, and if I had to guess, I’d say most of them wouldn’t–for the same reasons doctors aren’t likely to tell you to use garlic to address a yeast infection. You should not self-diagnose or self-treat your dental issues, but if you work closely with your dentist you can usually reasonably do some healthy holistic things on your own to boost your results. I believe that what I’m telling you works because it has worked for me and for my clients who have tried it. Oil pulling a few days a week has made my mouth feel healthier, and I haven’t had any cavities or other issues after doing it. What I really want to tell you about today, though, is my secret for white teeth! There is just one magic ingredient, and there are two ways I’ve used it. I buy activated charcoal here. When I do my oil pulling (I always use coconut oil), I add a small scoop (probably 1/4 tsp, but I don’t measure it) of activated charcoal to it and swish for 20 minutes like I normally do. You can mix the charcoal into the oil before you put it in your mouth, or you can just add the charcoal to your mouth after the oil is already in there (be careful not to inhale if you incorporate the powder into the oil while it’s already in your mouth–it’ll get sucked straight down your throat). At the end, I spit it into the trash (not down the drain! ), and rinse my mouth out. I get my finger wet and stick it into the activated charcoal. Then I run it over my teeth, paying specific attention to the gum line. It doesn’t totally coat my teeth, but it definitely makes me look like I’m about to put on some kind of scary rotten-mouthed halloween costume. I leave this for about 10 minutes, and then rinse my mouth out with water. 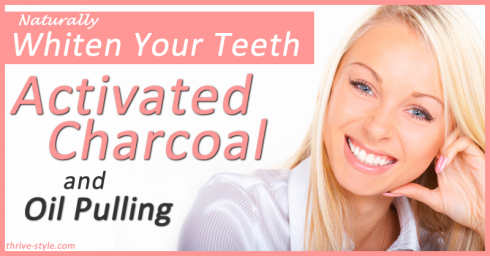 Activated charcoal will not whiten your teeth to an unnatural state. It does not “bleach” them, rather, it helps to removes stains. You would probably get the whitest white results from a chemical bleaching treatment, but if you want to go the more natural route and just get back to your best version of natural white teeth, activated charcoal can help you do this! It’s such a fine powder that it’s non-abrasive (it won’t damage the enamel on your teeth), and you’re not scrubbing your teeth with it anyway, so it’s very mild. You can do the activated charcoal without doing oil pulling, but in my experience, you get the best results when you do both (either at the same time, or not). What do you think? Will you try to incorporate activated charcoal into your oil pulling routine? Hi, I have tried it twice, but by brushing my teeth with it (toothbrush). It seems to make my gums sensitive… am I doing this right? Truth Love and Justice for all beings. Previous post: 30-Day Fermented Foods Challenge! Next post: Pregnancy Tip: The Superfood that Gives Your Energy Back!